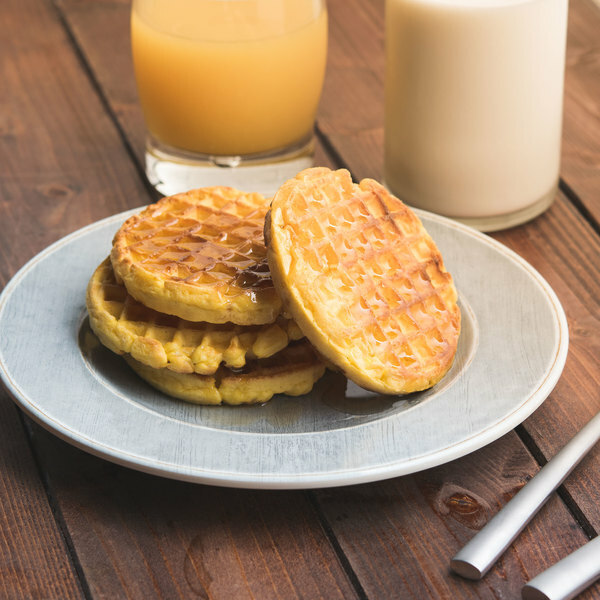 Whether you're serving up a hearty breakfast or a sweet, satisfying meal anytime throughout the day, you can be sure that Golden Barrel pancake and waffle syrup is just the treat your patrons are looking for to complement their meal. For over 30 years, Golden Barrel has been dedicated to providing customers with only the highest quality, best-tasting products by using only the finest ingredients. 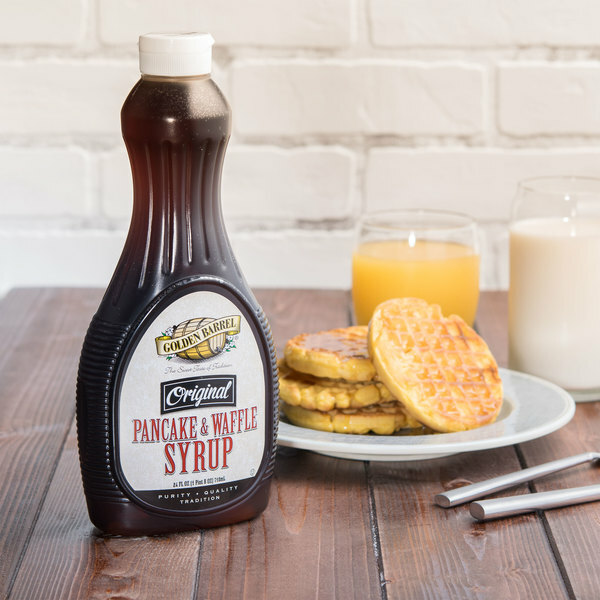 Following in that grand tradition, this pancake and waffle syrup combines the convenience you desire with the classic, sweet flavor that your customers crave. Drizzle atop a plentiful tower of pancakes or waffles for a sticky-sweet breakfast treat, or even pair it with powdered sugar, butter, or fruit toppings! This syrup's delightful sweetness, traditional taste, and smooth consistency makes it a deliciously-indulgent accompaniment to a variety of breakfast services. The 24 oz. capacity is small enough to place on individual dining tables, but holds enough product to keep your hungry patrons in good supply - whether they like a lot or just a little syrup, this bottle has got it covered. The easy-pour opening offers a smooth, steady drizzle to keep the syrup from flooding out, while still evenly coating your breakfast dishes. 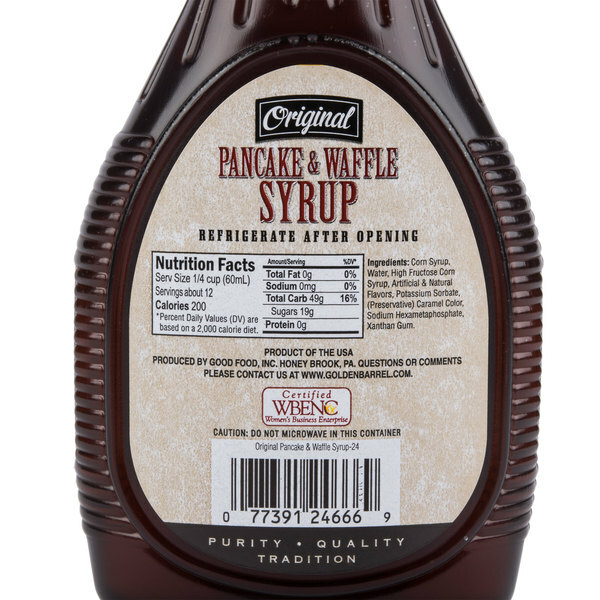 In addition, this bottle features an attached, resealable cap so that the bottle can be used until the syrup is gone, without transferring to another container. The cap also helps to keep the syrup from spilling out if the bottle is accidentally knocked over, therefore preventing unwanted messes. Ideal for diners, restaurants, hotels, and more, this Golden Barrel 24 oz. 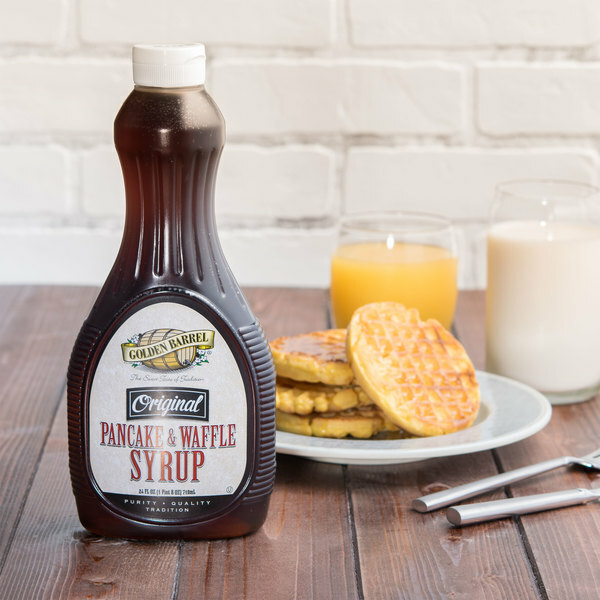 pancake and waffle syrup is perfect for adding a smooth, sweet flavor to your most popular breakfast offerings. This syrup is comparable or better than anything I have bought at the grocery store. My fiance is very picky and loves it. It also came shipped perfectly with no damage or leaks. My family loves this syrup! It tastes just as good as any other leading brands. It's a good size for such a great price! It is perfect for waffles!! 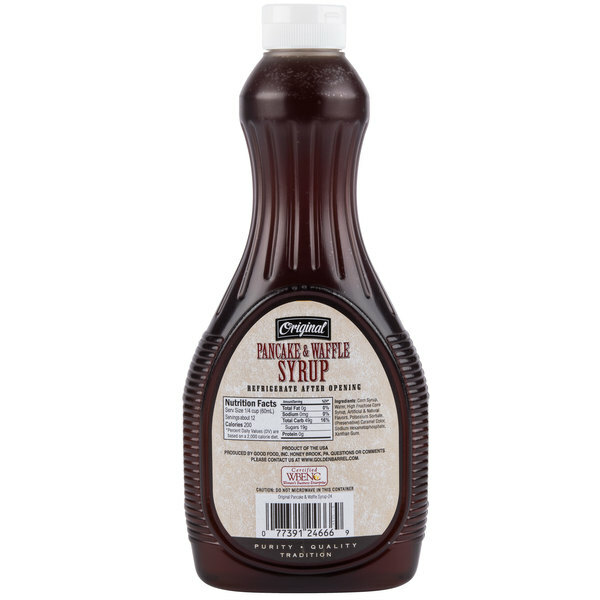 This pancake and waffle syrup is a great value, and tastes good. Annoyingly, a large sticker was stuck directly over the Golden Barrel label, and it cannot be peeled off without tearing the product label. Placing the sticker on the side would have been much more appropriate and wouldn't have impacted the bottle's label. Still, I'd purchase again. Syrup! Golden barrel pancake and waffle syrup! This is a 24 oz bottle of syrup. This is original as it is not lite or sugar free. Golden Barrel always makes great products. This one was no different. All the time we have customers that ask where we get our syrup, it is that good! A really nice Golden Barrel Pancake and waffle syrup mix that is great. The syrup is a great buy and perfect for our church pancake suppers. This is just okay syrup. I have definitely had better, but it is fine for the price. The maple flavor is not very pronounced and it is not too sweet. This twenty four ounce bottle of Golden Barrel Pancake and Waffle Syrup was delivered quickly and I appreciate the ability for rapid reordering!! Definitely a time saver. I would highly recommend this especially for those nervous about the sugar free taste because it is delicious. Easy to use and at a great price. I do wish additional waffle makers were available because reviews on the ones currently listed are not that encouraging. A surprisingly good tasting waffle syurp. Has a pretty authentic taste to it but for a much lower price than real maple syrup can cost. Golden Barrel Pancake and Waffle Syrup 24 oz. Bottle hey now inexpensive pancake syrup, how come you taste better than the leading brands but cost half as much? No big deal here, just be prepared to be sold out!! A great value bottle of syrup that tastes really good. A popular syrup at our diner and has the perfect consistency. Love the easy to pour bottle design. This Golden Barrel pancake and waffle syrup is good. This tastes as nice as the other well-branded pancake syrups out there but so much cheaper. And at 24 ounces, this is a better value for the money. We are glad to have purchased this. Golden Barrel Pancake and waffle syrup is the best. It has one of the most unique flavors and is sure to satisfy guests and family. I highly recommend this syrup. Golden Barrel makes a variety of differing products. We tried this waffle syrup and were not disappointed. Its true to taste without being to stick and has a clear transparent bottle that is easy to tell when it is almost empty. This is a very tasty waffle syrup. It is not overly sweet, just sweet enough! I had it with chicken and waffles and it was quite delicious! This is the very basic of maple syrups. It is good and does the job. It isn't as good as pure maple syrup but the price reflects that. This is good to have on hand though for much commercial use and turn around. This is a very tasty and bargain priced syrup. Great for the restaurant or for the home owners looking to buy in bulk. Very satisfied with this purchase. This is a good syrup for its price.Golden Barrel is a fairly good brand so you can't really beat this one if you are on a budget. This might be a good price but the flavors aren't really there. I look for something that I have a bit stronger of a maple syrup flavor and this is almost like it's water down but if you're looking for a quick syrup this works . We have not tried the Golden Barrel pancake mix, but if it is anything like this traditional syrup, we will be in for a treat. We were low on some generic store brought brand and wanted to give GB a try and we are glad we did. Its a smooth, not overpowering maple taste that is easily stored in a sleek looking 24oz. bottle. Great product- tastes like the real thing! Comes in a conveniently shaped bottle, and I would definitely recommend this product, even for just home use! 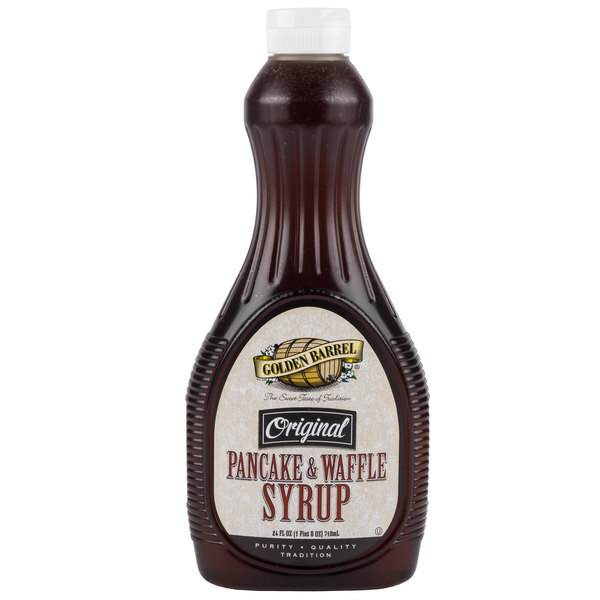 This is a fine pancake and waffle syrup--Similar to Log Cabin or other store brands. It was a good price and arrived nicely packaged to prevent leakage in transit. It goes well with the Golden Barrel Pancake & Waffle Mix...I recommend!